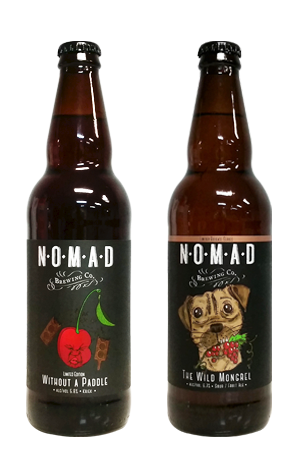 They're carving out quite a niche as one of the more experimental local brewers at Nomad these days. Among the limited release beers out for the middle of 2016 are a couple of quite different sours. One is Without A Paddle, the punny title given to their 2016 GABS festival beer: a take on the Belgian kriek style. It's a pinky purple drop, the result of 300kg of cherries being added to a base beer that had already fermented with yeast from a prior wild fermented beer at the Northern Beaches brewery. They lend the beer a welcoming fruity aroma, while to taste it's a combination of vinous, acidic qualities and cordial like sour cherry flavours, the result being something akin to a French table wine. The Wild Mongrel may share some acidity, but is a quite different beast altogether. It started out as the brewery's hoppy Cruisin' Ale to which was added 300Kg of Shiraz grapes. They add a hint of pink, albeit nowhere near to the extent of the kriek. The combination of hop bitterness and bacterial sourness result in a punchily tangy drink, not too dissimilar to a tangy, bitter, zesty grapefruit juice. Refreshingly tart, with the influence of the grapes growing as it warms.